Microsoft has faced another targeted attack by the Syrian Electronic Army (SEA), a group supposed to be aligned with Syrian President Bashar al-Assad. The SEA group is popular for its advance phishing attack and using the same technique they also hacked into the Official Twitter account of Microsoft News, Xbox Support, Skype and also defaced the Microsoft, Skype Official Blog pages in the past few weeks. Yesterday, Just after the Microsoft uploaded the newly designed website of it 'Microsoft Office' blog, the Syrian Electronic Army gang again compromised it successfully. 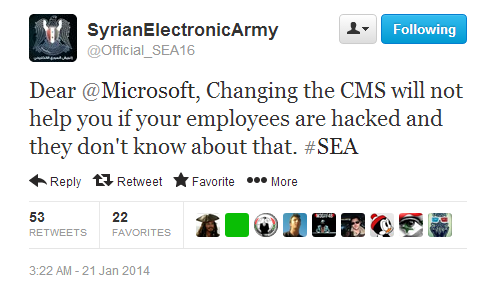 SEA uploaded the hacked blog screenshots on their twitter account, with a defacement article titled “Hacked by the Syrian Electronic Army", as shown. Before, they also taunted Microsoft that "changing the CMS will not help you if your employees are hacked and they don't know about that." One of the most famous saying from Bill Gates read,“I always choose a lazy person to do a hard job because a lazy person will find an easy way to do it”, but now it’s time to hire some clever and pro-active employees in the Microsoft to defend itself from such foolish attacks i.e. Phishing and Social Engineering.